This post will share some quotes and wisdom from the book Jesus was a Double Diamond: 58 Master Secrets for Total Success by Mike Murdock. This is an old Amway book that I found in a thrift store while my wife and I were visiting Atlanta, Georgia for my niece’s college graduation from Georgia Tech. Being an old Amway guy, many moons back, this book naturally caught my attention. Just seeing the title, I knew it had something to do with Amway, before I even picked it up. The book was tattered and worn, so I got it for 10 cents. Not bad. I started reading it in the hotel that very night, and I have to tell you, I LOVED the book. It was loaded with so much wisdom. While it might not appeal to non-religious people, I believe the information is beneficial to ANY network marketer. There is so much wisdom in this little book. Plus, it’s a fun and easy read. Listed below are a few of my favorite quotes from the book. They are listed in no particular order. Each quote is in bold and italics. After each quote, I will share my own two cents. # 1 Successful people are simply problem solvers. In network marketing, think of yourself as a consultant, not a salesperson. Your job is to show people how your products, service or business opportunity will solve their problems. Show people what’s in it for them and you will make more sales. # 2 You will never succeed in any business unless you really believe in that business. You must have 100% conviction in what you are doing or you will never survive the difficult times. # 3 You must take the time and make the effort to know your product. In network marketing, your real product is PEOPLE. Work on your people skills and become likable. # 4 Anyone who does business with you wants the truth. Always keep it real with people and tell them the truth, rather than what you think they want to hear. # 5 Address the benefits. Focus on the advantages that your product or your business will offer to another person. But never forget that an honest relationship is worth one hundred sales. Show people what’s in it for them and how they will benefit from your products, services or business opportunity. # 6 Work time is giving. Rest time is receiving. You must have both. This is something I personally struggle with, but it’s important. Take time to work and time to rest. Your family and mental health need it. # 7 Take one day a week off completely. Plan a personal or family day (if you have a family) once a week. This strengthens your bond with them and recharges you. # 8 If you cannot plan events for twenty-four hours in your life, what makes you think you will accomplish your desires for the next twenty-four years? Learn how to manage your time effectively. Since you are doing the business part-time, it’s critical that you get a grip on your time management skills. # 9 The secret to your future is hidden in your daily routine. Show me how you spend your time each day and I can predict how well you will do in the business. # 10 Rejection is not fatal. It is merely someone’s opinion. Don’t take it personal when someone tells you no. Just move forward to the next person. They’re not rejecting you anyway, they’re rejecting what you are offering them. # 11 Jesus was willing to experience a season of pain, to create an eternity of gain. Some things last longer than rejection. Behind every great victory there will be an even bigger struggle. # 12 Success requires people. You will never succeed without networking with many different kinds of people. Success is a team sport. Don’t go it alone. # 13 Almost everyone in your life is more preoccupied with themselves than you. Don’t worry about what others say or think about you. They’re probably not thinking about you anyway. # 14 People always fight what they do not understand. Most people are scared of change and scared of the unknown. It’s basic human nature. # 15 You must never allow what others say about you to change your personal opinion of yourself. You must love yourself and ignore what others say about you. # 16 Champions do not become champions in the ring. They are merely recognized in the ring. All of the things you go through behind the scenes are what will make you a champion. # 17 You will never have significant success with anything until it becomes an obsession with you. Success on a grand scale in anything in life takes a 100% commitment. # 18 Find something that consumes you. Something that is worthy of building your entire life around. Have a calling in your life, a purpose, and devote your life to it. # 19 Respect those in authority over you. You’ll never learn how to lead until you learn how to follow. # 20 Stop pre-judging people. Your first impression is always limited. Keep an open mind and don’t be too quick to jump to conclusions. # 21 People are motivated by two forces: Pain or pleasure. Fear or reward. Loss or gain. People will do more to avoid pain than they will to gain something. # 22 People never buy your product for the reasons you sell it. They buy products for what it will do for them. Find out what your prospects wants and show them how to get it. # 23 Never build your future around your past. You can change your life anytime you want to. Don’t dwell on the past. Plan for the future, live in the moment and cherish the past. # 24 Critics are spectators, not players. Critical people are usually disheartened people who have failed to reach a desired goal. If you don’t have critics, you probably aren’t doing much with your life. # 25 You will always remember what you teach. The best way to learn a new skill is to teach it. # 26 You need good people around you. You need inspired people around you. You need informed people around you. You may be their only source for information and motivation. Surround yourself with people who uplift you and encourage you and bring out the best in you. # 27 Bitterness is more devastating than betrayal. Betrayal is external. Bitterness is internal. You see, betrayal is something that others do to you. Bitterness is something you do to yourself. When you hold a grudge it only hurts you. # 28 Everything you are presently doing will benefit your present… or your future. The choice is yours. Practice delayed gratification. # 29 Nothing is ever as it first appears. Keep an open mind and don’t be too quick to make a judgement. # 30 Someone has said you must hear something sixteen times before you really believe it. It takes time and repetition to build up your belief in something. # 31 Everything is difficult at first. It takes time and lots of practice to master any skill. # 32 Thousands will fail in life because they are unwilling to make changes. For things to change you must change. # 33 Popularity is when other people like you. Happiness is when you like yourself. If you can’t like yourself, don’t expect others to like you or make you happy. Happiness comes from within. # 34 When you decide exactly what you want, the how to do it will emerge. If you don’t know why, the how doesn’t really matter. # 35 When a salesman is excited over his product, the customer feels it, and is influenced by it. Enthusiasm is transferred from the salesperson to the prospect, not the other way around. # 36 Great men simply have great habits. We are all creatures of our habits. Change your habits if you want to change your life. # 37 Champions are finishers. Everyone starts things, but champions always finish what they start. # 38 Great businesses do not happen overnight. Most businesses, in just about every niche, take five or more years to become a success story. # 39 It is more productive to get ten men to work rather than you do the work of ten men. Delegate as much as possible. The real beauty of network marketing is the leverage that you get through the work of others. # 40 Great leaders accept responsibility for their troops. Take 100% responsibility for your own life and business and for your followers. The buck stops with you. # 41 Your mentor is anyone capable of growing and increasing your life. Always have a mentor in your life, preferably several. Look for people who have skills or experience you want to acquire and ask them to mentor you. # 42 People rarely respect and follow anyone they are capable of intimidating, dominating or manipulating. Have a strong character and be unstoppable. # 43 The secret of your future is determined by the seeds you sow today. You must sow before you can reap. Good things take time. 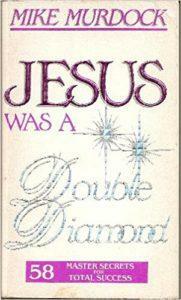 Although this book is about 25 years old, Jesus was a Double Diamond is a great read, filled with tons of great quotes and wisdom. If you haven’t read it yet you should. You can order a copy here. What quote listed above was your favorite and why? Leave a comment below to share your thoughts. I look forward to hearing from you. Next Next post: Building Your MLM Business Slow or Fast: Which Makes More Sense?